These workshops assist employers in meeting the current federal and selected state regulations for National Certification of Crane Operators and include the NCCCO National Certification Written and Practical Exams. The training curriculum is designed to prepare students to take the applicable NCCCO National Certification written exams and covers pre-operation inspection, controls, functions, stability, set-up, outriggers, leveling, cribbing, hazards, wire rope, load hooks, load handling, traveling, rotating, elevating and lowering loads, load placement, load rating charts used on the exam, load weight calculating, calculating lifting solutions and signaling/spotting. Online registration for NCCCO Preparatory Courses and Exams is currently disabled. Please contact John Kirk at our office to register or get class information. 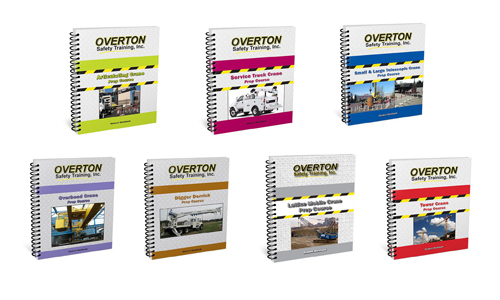 He can be reached at (866) 531-0403 or john@overtonsafety.com. Mobile Crane TSS AGC Pasco, WA None at this time. Mobile Crane TSS AGC Spokane, WA None at this time. Articulating Crane AGC Boise, ID None at this time. Mobile Crane AGC Boise, ID None at this time. Articulating Crane (ABC Only) Hiab Hauppauge, NY None at this time. Articulating Crane Hiab Hurst, TX None at this time.